Just got back from a class at my LNS! 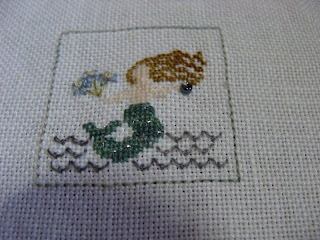 I went to Where Victoria's Angels Stitch to attend my second in person Brightneedle class. (I've taken some online classes as well.) This was the class piece, Good Fortune. 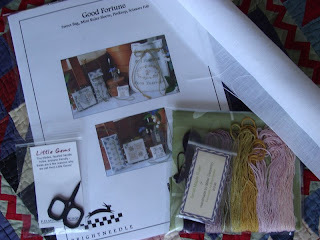 This is what the kit looked like (along with my Little Gem scissors by Kelmscott Designs that I picked up today). It came with a nice little wooden ruler to stick in the ruler case. I was so excited to meet one of my online friends, Karin! She's very nice in person, and has this lovely accent. (I love cool accents.) And she had a nice cosmetic bag from Vera Bradley that was perfect for carrying stitching tools in! I swore I wasn't going to buy anymore Vera Bradley! lol! 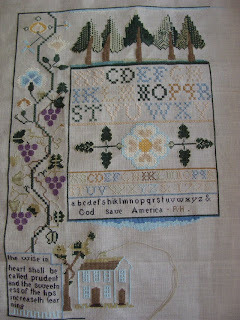 Anyway, Ann Pettit of Brightneedle taught the class. Liz Knudsen wasn't able to come, but I did get to meet her last fall when I took another class from Brightneedle at the same LNS. The fall class was Cape Cod Passport. 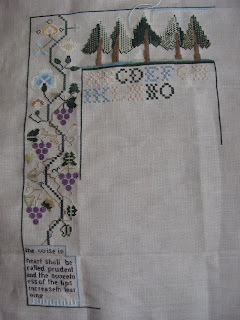 While I didn't put a single stitch in today's class, I can show what progress I made on last fall's class. 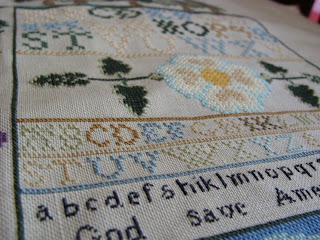 Nope, I didn't finish it, but if you want to see some Brightneedle class finishes, go to my Photobucket album (there's a link on the sidebar to the right). Hopefully, I'll finish both these projects, plus the Dreamkeeper Etui which I also haven't finished, sometime in the future. While there, instead of starting the class piece, I did some stashing! lol! I hadn't been to my LNS in so long, so I went a bit crazy. :D Had to pick up a few of the pieces I hadn't gotten yet from Nashville market. 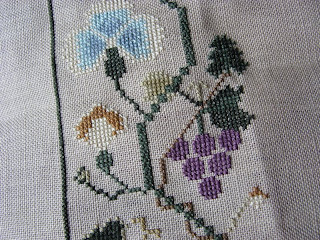 The DMC is for a freebie I'm planning to stitch up sometime. 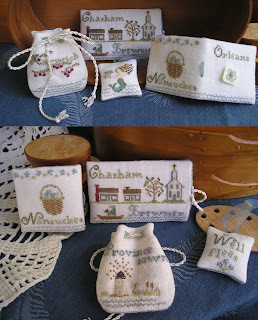 A few more market items. 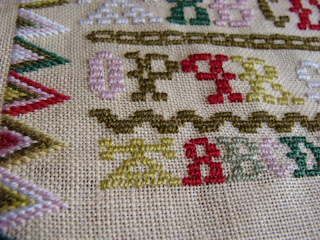 Ann was also teaching another class in the afternoon, but since I'd already stitched that one, I came home and am now blogging. On a different subject, I haven't posted any progress pics of Rachel Hyde recently, so here she is in all her glory. I think she's just soooooooooo pretty!!! I think that's all the news. 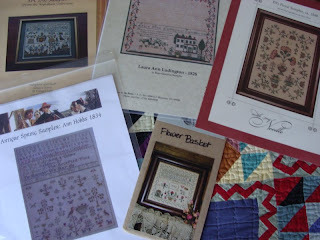 Except that I've already signed up for the next Brightneedle class to take place in the fall at my LNS. And I hear that another designer will be there on another day -- and I will definitely sign up for that as well! lol! And finally, as per request, here is a picture of the Blackbird Designs fabric that I picked up last weekend in Rhode Island. The picture is a bit washed out, but hopefully you get the idea. It's sunny and warm today -- finally feeling like summer! Of course, I would have preferred staying with spring, but whatever! lol! Thanks for visiting -- I love reading your comments and knowing you're all out there! Have a great weekend! I went away this past weekend -- actually from Thursday through Sunday. Went to visit a dear friend who used to live in my neighborhood but moved away a long while back. She's a knitter, not a stitcher, so I didn't get any stitching done while I was gone. But since I got back, I made this little French beauty. 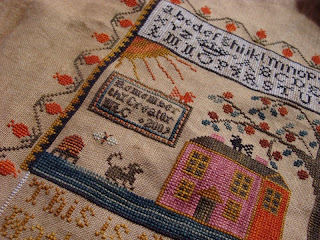 This, of course, is the freebie from Blackbird Designs' new blog. 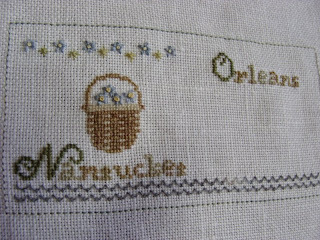 If you stitch it up and submit a picture before April 27th, you can be entered in a contest drawing for some French goodies that Alma and Barb are bringing back from France. I couldn't resist, even though I probably won't win. But here's hoping! Even if you don't want to enter, you should bookmark their blog -- it's wonderful! Oh, and I should mention that my name, date and the swan aren't part of the original design. 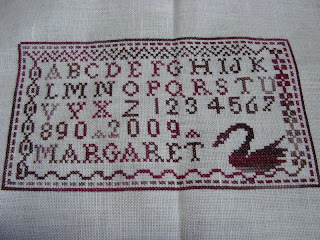 The swan is from the freebie from Gigi and Carinne Quaker 6 a Mains. Anyway, back to my weekend. 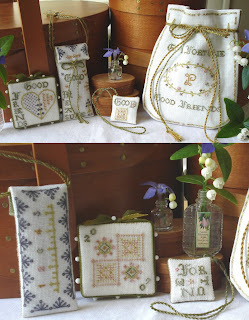 We had a grand time, doing lots of antiquing, some yarn stashing from WEBS, who is having an annual sale (you can get the savings online here as well), eating lovely lunches out and generally having a ball. 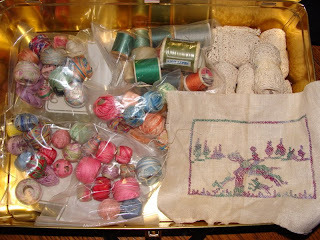 Here is a picture of some of my vintage threads, lace, and other items from the antiquing. Sadly, there's not much more progress to show on Rachel Hyde since last time. Not enough to warrant a picture anyway. Hope the rest of your week is great -- enjoy the springtime that is finally starting to show! I've gotten more done on Rachel Hyde. As always, it's slower going than I would like. 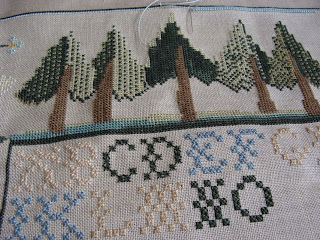 Those pine trees took forever! And I'm really not in the mood for rice stitch. I don't mind eyelet as much. But the alphabet is in both. It's looking nice though. I love the colors. 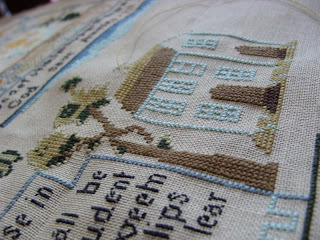 It's fun to be stitching something that uses my old green and blue favorites. I still love red, of course, but these are my first loves. lol! 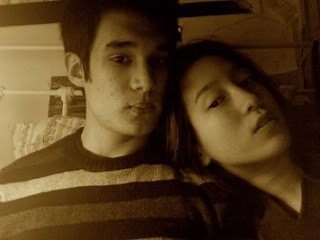 In other news, Nina is having a contest over at her blog. 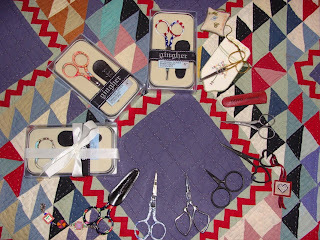 In order to enter, you're supposed to show your scissor collection on your blog. So here I am this morning, running around trying to remember where all my scissors are! I managed to find what I think is most of them, but I know I also have a few preemies and others lying around. Anyway, here is most of my collection. The Gingher ones I've been trying to get from Shepherd's Bush the last couple of years so I can get the matching scissor fob. 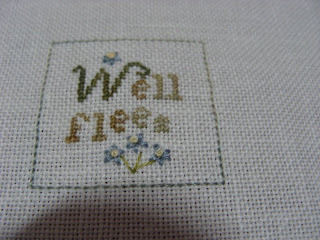 But of course I haven't stitched any fobs yet! Oh well. 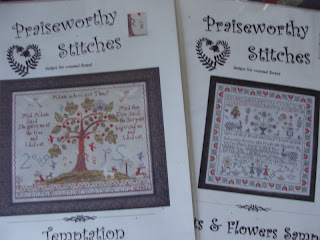 I have a couple of Dovos in there, as well as some scissors from Kelmscott Designs. Thanks, Nina, for the giveaway! 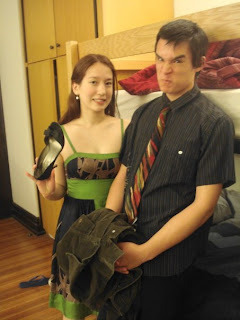 In more news, remember the Freshman Formal that my daughter attended at her college with her boyfriend? Well, she didn't take any pictures, but her roommate did. Of course, the girl child only sent me one of them, and a silly one at that. Sigh. Oh, and I see that the boy child's efforts to pass the dress on to the boyfriend were all for naught. She's wearing a different dress!!!! I'm not going to mention that to the boy child. lol! 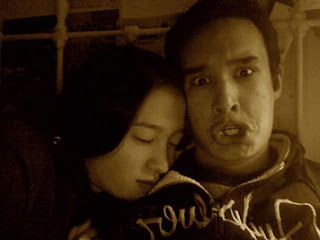 Seems the boyfriend is good at making faces for the camera. Hard to get a serious picture from him! I think it's really different from lots of traditional samplers. And I'm really liking it so far. 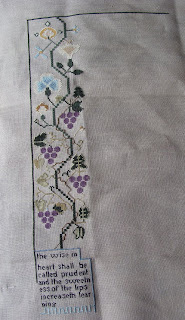 I've finished the whole left side of the design. It's Rachel Hyde from Threads Through Time. 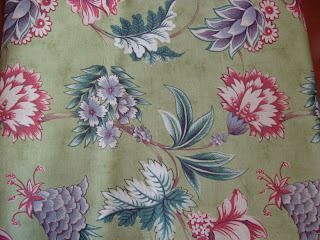 I'm being extremely boring and using DMC with 40ct Summer Khaki -- that's what the chart called for and I happened to have the fabric in my stash, so that's what I went with. Part of me really wanted to go with a pretty fabbie, but I couldn't decide on one from my stash. So the boring route was chosen. 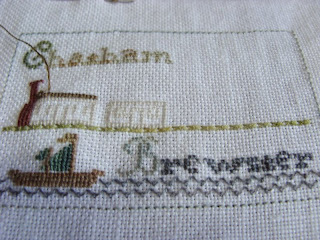 Rachel, bless her soul, did some over one work, but it's all in tent stitch! 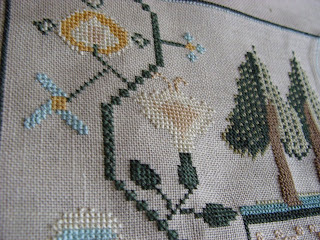 Of course, she chose to do her tent stitch in different directions, depending on her whim, so it's more challenging than just plain tent stitch. But not much more. 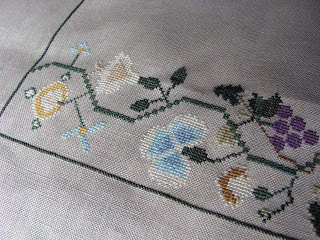 It's nice to do over one tent stitch knowing that's what Rachel used! 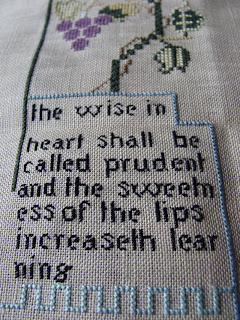 There isn't a picture of the whole piece that I could find online, but if you google Rachel Hyde, you may be able to find a picture on someone's blog. :D I know there's one out there. A big thank you to Melody for this chart! I owe you one! Thanks again for your comments. It seems most of you find that girls talk about stuff more than boys do. And I agree. Just not with my kids. lol! From the time the girl child was small, she never told us anything. I still remember picking her up from nursery school and asking her how her day was. And it's been the same all through her life. Now she'll she tell me yes, she had a great weekend, sorry no pictures of the Freshman Formal, but it was fantastic. In an email. If I hear from her -- usually by IM -- I always know she needs something! lol! Now the boy child is actually better than his sister. He still doesn't talk too much and will generally say the usual "nothing" for an answer. But he does definitely talk when he's excited about something. To continue from last weekend's paintball event, recall that he went to his friend's house almost immediately after he got home from the paintball event, and so we didn't hear or see much of him after that. But once I got him home from his friend's house and he sat down with me, he gabbled on and on about his weekend at the paintball event. 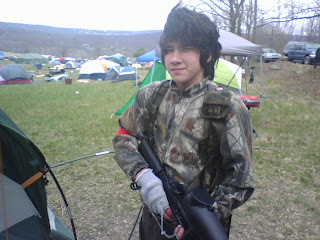 Boy, is he enthused about scenario paintball! He desperately wants to go to another event asap! He even showed me a video on Youtube of him and his teammates attacking a tank! So I heard a whole lot about paintball, WWII paintball guns, grenades, tanks, famous paintball dudes, and more. Yes, the boy child IS capable of talking to me! :D BTW, here's the video from Youtube that he showed me. Tanks were one of the big exciting things for him! So for me, neither kid tells me much. But the boy child tells me more than the girl child! The girl child is coming home just for the weekend for Easter. There isn't a break at her college, so it'll be a short visit. Have a great weekend, everyone. And Happy Easter and Passover! So are you sick of Ruthie Sunday yet? I must be. I got all the pictures onto my computer, and then promptly got distracted by emails and getting the boy child up and making appointments for cars (they'd better fix the ac this time, for Pete's sake!!). And there's this really annoying device hidden somewhere in the bowels of all the baggage that the boy child brought home from paintball -- it keeps ringing and talking, and sounding very walkie-talkie like! Have no clue where the darned thing is though. I did confirm with the still-sleeping child that he does have a device somewhere in that pile that will sound like that. Which was a relief after all the wondering what the heck that sound was since yesterday afternoon! Anyway, here is Ruthie. Serves me right for not looking at the instructions ahead of time. I sat down to pick Ruthie up again and discovered much to my horror and dismay that the next row of letters was -- you guessed it -- satin stitch again!!! 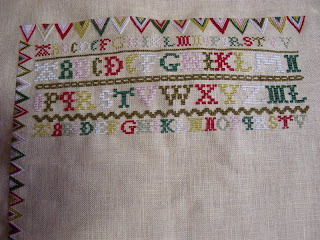 The good news is that these satin stitch letters were over two threads instead of three and thus much easier to stitch. In other news, the boy child came home from his paintball event all tired and muddy. Talk about muddy! UGH! I've been spoiled with my kids. Never have they ever really participated in a sport or event that involved mud. So this is something new for me. Talk about disgusting! But he had a great time. Didn't tell us too much about it though. He came home, took a shower, got pumped by us for information about his weekend for a few minutes, got a text message on his cell phone from one of his friends who had been at the event as well, and promptly went over to that friend's house. Didn't see him the rest of the day. 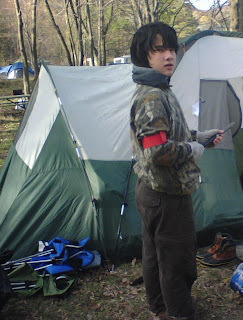 Thus our puzzlement over the talking, ringing, crackling thing hidden in his piles of paintball paraphernalia. The girl child apparently had a great time at the Freshman Formal with her boyfriend. But of course, she didn't take any pictures so I don't have any evidence of this fact. And also of course, I just got a two line email telling me she had a fun weekend and that was it. Does anyone else have kids who don't tell them anything about their lives? lol! Anyway, since I can't show lovely pictures of the girl child and her beau, I'll show a couple more of the boy child and his paintball fun. He poses for his friend's father much better than for us. I've finished This is the Day! I'm very pleased with how it came out. 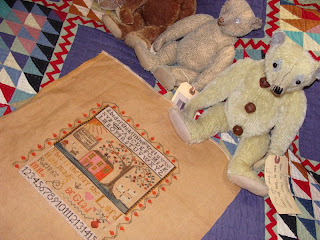 So are my bears. Sorry, this is my poor excuse for an art shot. I don't know how you ladies do it, taking gorgeous arty pictures. 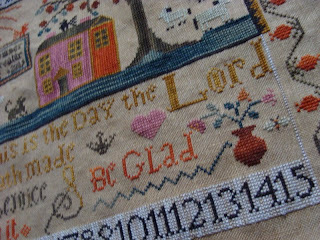 The other thing I don't know how to do is to put down in a different font the name of the piece, the fibers and fabric used. I'm sure I actually know how, but I'm too lazy to try it out. So you'll just have to suffer with me. 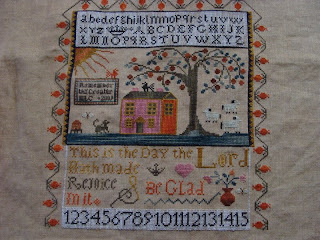 This is the Day is from the Just Cross Stitch January/February 2009 issue. 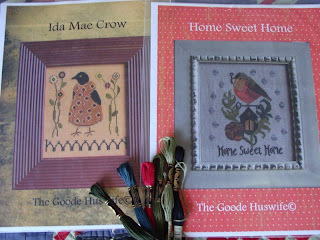 It was designed by Tracy Riffle of Hands to Work. I used the called for 40ct. 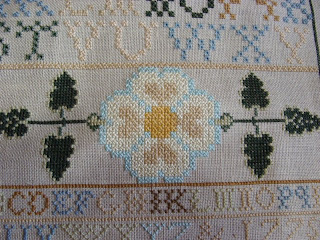 Autumn Gold linen by Lakeside with the called for GAST, WDW and CC fibers. And I love it! In other news, the boy child is away for the weekend. 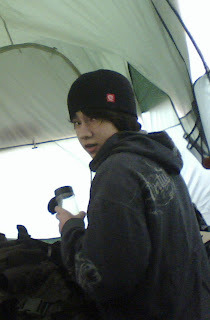 He's attending his first ever scenario paintball tournament. He's in it bigtime -- camping out, taking part in a 2 day event. He was so excited when he left. Here's a picture his friend's father sent from his cell phone. The girl child is still at college. She's happy this weekend too -- her boyfriend went down to spend the weekend with her. There's a Freshman Formal that they're going to. On Friday, the boy child was obliged to carry a bag to school containing the girl child's dress so he could give it to the boyfriend to take down to the girl child (the boyfriend is a senior and goes to the same high school as the boy child). (Did all that make sense??) I'm sure the boy child got rid of the offending bag asap! I don't have any pictures of the girl child or the boyfriend at the Freshman Formal. I do hope she takes some pictures. Enjoy the rest of your weekend! And if it's spring break time around your area, enjoy that too! Ah, the green is starting to show outside! Yay!